Beans are just a staple in most parts of the world. However, cooking the dried ones consumes more time than you may have. That happens even when you have a pressure cooker. For that reason, canned beans gain more popularity. It doesn’t matter whether you intend to enrich your taco meal or just gear up your rice, refried canned beans will give you the ultimate flavor and taste you desire. Nevertheless, not all of the beans are high-quality beans. It’s, therefore, your duty to find the best canned beans for your family. This article is going to guide you into the best canned refried beans to choose. Whenever I want to buy canned refried beans, I often have various questions in mind which I’m sure every other person does. What do I want to use them for? Do I intend to have it as a side dish or I am going to blend it into another meal? Does the family want it smooth or chunky? Canned beans are usually either smooth or chunky and different textures are preferred on different meals. You get to choose the texture you desire. For example, when I need the beans to be over my rice, I like them chunky. But when using them over the pizza or tortilla they must be smooth. All these, in the end, give my mouth a good feel. I’m not a vegetarian but I have friends who are vegetarians and they visit me often. Since I often keep the canned beans on my pantry, I prefer to keep both options to suit everyone. The vegetarian option is indicated as vegetarian. The non-vegetarian contains lard which is an animal by-product. It’s said to give the beans a smoother texture. If you want though you can also use milk or sour milk instead. This is in reference to the number of spices you prefer. Some people like their beans being full of flavor and spices while others don’t. You are guaranteed to get every level of flavor and spice. From mild to hot and spicy, all these options are available. What I know about canned beans for sure is that they are rich in fiber and micronutrients. You can have them in 3 options below. The cook and serve option: this one requires you to cook the beans by adding some water. I prefer this to the heat and serve one below as they are richer in taste and flavor. You can cook them on your gas tops or induction surfaces. Don’t worry as cooking it takes about 5 minutes. Heat and serve: this is best used when you have no time to alter the preparation. You just open the can and heat it of your microwave or other stovetops then serve. You don’t need to add anything, not even spices. They are ready to eat. Cooking it afresh: this is for those who would love to make the beans in their own way. Here you determine the level of spiciness and how well you would love to cook it. They consume time compared to the two above but they also let you choose how you want the beans to come out. These foods can either be healthy or not depending on the mode of preparation. For example, if you prepare your beans using animal fat, they could be high in cholesterol as opposed to those you prepare using the olive oil or canola oil. That’s the same for those beans that contain lard vs those without. Most legumes are rich in carbohydrate, potassium, iron, proteins, magnesium and folate. The refried beans have both soluble and insoluble fats which are both essential in our bodies. This is an ideal option for those who have cut off the meat consumption. The beans will provide both the proteins and iron. The electrolyte and potassium aid in normalizing the blood pressure. These beans have high soluble fibre which helps to slow digestion of carbohydrates which reduces their impact on your blood sugar. The low glycemic index rate helps to control your hunger level and appetite which ultimately makes you maintain a perfect weight. If you will make your canned beans, you can reduce or determine the fat used while regulating the amount of sodium you put in it. Always read the label of nutrients in the beans you are choosing. The breakdown of ingredients varies from one option to another. Some may have about 217 calories with 3 grams of fat and 13 grams of fat. You can also have 336 calories with about 16 grams of fat and 12 grams of fibre. There’s no clear-cut distinction to the number of carbohydrates in each tin of beans. What matters most is how the meal is prepared and the ingredients used. Note that, these beans make up for about 5lbs of the 8lbs consumed in America. Although the beans were initially Mexican cuisine, we have embraced the use of beans in our diets. This is especially a healthy option for vegetarians. Basically, the major ingredients in the refried canned beans are beans and water. Non-vegetarian beans contain lard, salt, distilled vinegar, onions, garlic, some pepper and natural flavor. Sometime the beans may contain soy. The difference with the vegetarian option is that it contains no lard. This makes all the difference in the healthiness of the beans. When the processing is taking place, the liquid oil is transformed into solid fat causing the formation of trans fat. This fat raises the blood level of the bad cholesterol while lowering the good cholesterol. This means that when you are consuming the refried beans you should take the cans with a reduced amount of lard or no lard at all. The fact that these beans are slow cooked make them develop their naturally rich flavor. They contain a hint of lime to make them suitable for your snacking options. It further contains the jalapenos, cilantro, chillis and garlic to enhance the taste. Made using organic and high fibre ingredients, the beans contain relatively low fat and zero cholesterol. It’s high fibre nutrients make it ideal for use with every member of the family. Note that, it also has a lower calories level. It contains no GMO, preservatives and additives and its packaged in a BPA free can that is further eco-friendly. It has a longer shelf life than most other beans. Remember to refrigerate it for 7-10 days after you open the tin. The use of natural ingredients makes it a sweet brand. It’s versatile which means you could use it in various meals you have. You can also choose to eat it directly from your can. The brand is relatively cheap and since it has a longer shelf life, you will utilize every penny you put into the brand. The packaging is easy to heat, open and store. If you like the traditional flavor of beans then this will suit your palate needs. It features the use of high-quality beans only and simple ingredients that flavor and spice it. The garlic, onions, spices and vinegar aside from the beans and water give it a mild flavor. It further contains lard which enhances the smooth texture of the beans. The beans are an excellent source of fibre and protein. It contains no cholesterol, trans fats and only 11 grams of carbohydrates which make it ideal for use by people concerned about their weight and health. It has the low sodium content and it suits the burritos, enchiladas, tacos among other Mexican delicacies. Their taste and smooth texture can’t go unnoticed. It is a heat and serve kind of meal which means it requires not many alterations in taste. Although it’s mentioned to suit the Mexican cuisine since it was founded by a Mexican, it will work well with any other cuisine. What began as a mother’s delicacy to her family is today serving a whole world. Who knew this would? With the brand’s commitment to quality, we are going to see the beans cans for more years to come. For these beans, although they contain soy, they have less amount of salt which makes them closely similar to regular beans. It contains additives and cornstarch syrup which is high in fructose. It also ultimately influences the taste of the beans. The beans are chunky which means it has a great influence on your meal’s texture. Use them whenever you want to enhance the texture of your meal. It also has the ideal consistency that is neither too watery nor too thick. They suit the vegetarians as they contain no animal products. The protein content is high yet it contains no saturated fats. 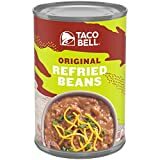 From the name, the beans are made for taco bell and it tastes like the original taco bell. When you want to eat them straight out of the can, you can add cheese or a desirable sauce. consider heating them though they are edible even when cold. If you are concerned about the taste, flavor, nutritional facts and texture, you should choose these beans. For the balance in texture and flavor, it will work with various other meals. I specifically adore the Amy beans. She makes the best beans and doesn’t limit it to this style only. There are various other flavors to choose from. The packaging also allows you to see the kind of beans you are getting. This one contains chilis and it’s meant for vegetarians. All the ingredients used are organic and its kosher certified. The brand offers a balance of flavors that create harmony while making it as close to the real beans as possible. They have low sodium level and it appears bland alone for some people so you might want to flavor it a little more. For me, this works when I add it to my taco meal. However, if you want to use it on pizza or other foods like that, spice it but never add salt. You can use it on burritos or as a side dish. Also, if you love the other Mexican dishes, you can cook them with this kind of beans. This is a smooth option that is gluten-free and USDA certified. For your perfect source of fibre and protein, choose Amy refried beans. Although they come in a bag, they are really an ideal choice that you don’t want to miss in this list. This is the ideal cook and serve version of beans. They need you to mix them with some water and cook for 3-5 minutes. For me, they are a little too bland but with the option to cook and serve you can alter the taste in minutes to your desired taste. It’s high in fibre, free of cholesterol, gluten-free and your ideal protein source. For the vegetarians, this is another best choice since it contains only beans and water. No additives that would rather alter the taste completely. Its neutral taste makes it blend well with other meals without influencing the flavor of the meal. In fact, with it you taste the beans flavor than you do other spices. What’s more, it’s your ideal option when serving a family’s taco night. Since its dehydrated, its 7.25 ounces of beans will serve up to 6 people in your family. The packaging makes it ideal for camping and other outdoor activities because they are light. It also means that you take only healthy meals on your outdoors. For the traditional rich and nutritious beans buy the bush beans. The black beans are the main ingredients in this and they contain no gluten. It also has a low content of fat. The beans are cooked to assume the perfect texture. You can eat it as a side dish or accompaniment of particular meals. They are rich in fibre and protein which makes it suit your tacos and burrito. Whenever you are thinking of eating your rice and chicken consider these beans to give you the authentic texture. I further love the seasoning used as it gives it a mild flavor. It features a blend of vinegar, onion and garlic powder. The ingredients used make the flavor natural. It’s further cholesterol free which makes it ideal for vegetarian’s healthy meals. Remember that you should never heat the beans in the same packaging it comes in. Do you enjoy it traditionally Mexican? This is your best bet with low fat and high fiber for the enhanced richness and goodness. It will bring you close to Mexican cuisine even if you are a non-Mexican. It contains a reasonably low number of calories and no cholesterol. With its minimal fat, those with health concern can choose it. Besides, it assumes an authentic texture with rich flavors which are from a blend of ingredients. This is a blend of both worlds, whether you are vegetarian or not this is your ideal canned beans. It works as a perfect side dish or accompaniment to various Mexican cuisines with its chunky texture. It’s made with a blend of spices that give it the right flavor and taste. It’s a good choice for the fat-free beans plus its cholesterol-free. Although it has its fat reduces, it has a taste that’s close to the one with full fat. This is your cook and serve option although you can heat it and serve because it’s richly flavored already. Rich in fibre and protein the beans deliver you the great delicious choice thus bringing the star-rated restaurants home. This authentically Mexican delicacy is eaten with almost everything. They are made using pinto beans and cooked until they become tender but they are sometimes mashed or left chunky. 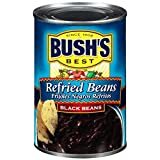 Whether you are heating the homemade beans or canned refried beans the procedure is the same and you are just aiming to not dry out the beans, right? Take your canned beans and place in the pot. On your medium heat stovetop, place the pot of beans and stir the beans so that it doesn’t stick on the pan surface. You could use chicken or meat broth to protect it from drying out. Sometimes I just use water. Add a tablespoon of either the water or broth at a time. Continue to stir until they reach your desired consistency. Note that, if you add too much water, the beans will develop a runny texture. Let the heating process take about 5 minutes or until its fully heated. Remember, if you allow the beans to boil, chances are that it will begin to stick on the surface of the pan. Always store the unopened cans in a cool dry place but never on the floor. For enhanced shelf life, keep the beans away from direct sunlight and never freeze it. Your opened beans are delicate. Refrigerate them in a tight nonmetallic container but use it within 2 days. Use the beans as alternatives to meat dishes or as veggies in other instances. They may act as accompaniment to another main dish. Only top it with grated cheese. It works best in most Mexican meals. Heat your beans slowly under medium heat to avoid drying out and burning. A tablespoon of vegetable oil. 25 teaspoon of ground cumin and chili powder. Place your onions, jalapenos and garlic in a pan with the oil. Add the 2 tablespoons of water and all other ingredients remaining except the cheese then stir it continuously to avoid sticking on the surface make sure you have a medium-low heat. Place your beans on a plate and shred the cheese over it then serve hot alongside whichever main dish. When you intend to make your beans creamy you will need about 3 ingredients besides the canned refried canned beans. Here, you combine the beans with the Crisco and milk in a skillet then heat over medium heat. Remember to vigorously stir or whisk as its heating until it becomes smooth. Add the last ingredient which is cheese to melt. Serve hot with your readymade tortillas. 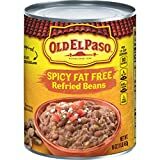 Do Canned Refried Beans Go Bad? Yes, they do. But you can lengthen this time with proper storage practice. Your unopened cans can last anything between 3-5 years when placed at room temperature and at a cool dry place. For your safety, however, remember to read the best by date indicated on the can. You will tell that your beans are spoilt when you notice that it has a foul smell. They may also develop molds and they will also change the appearance. On the other hand, your opened cans will last anything between 3-5 days when properly stored in a refrigerator. 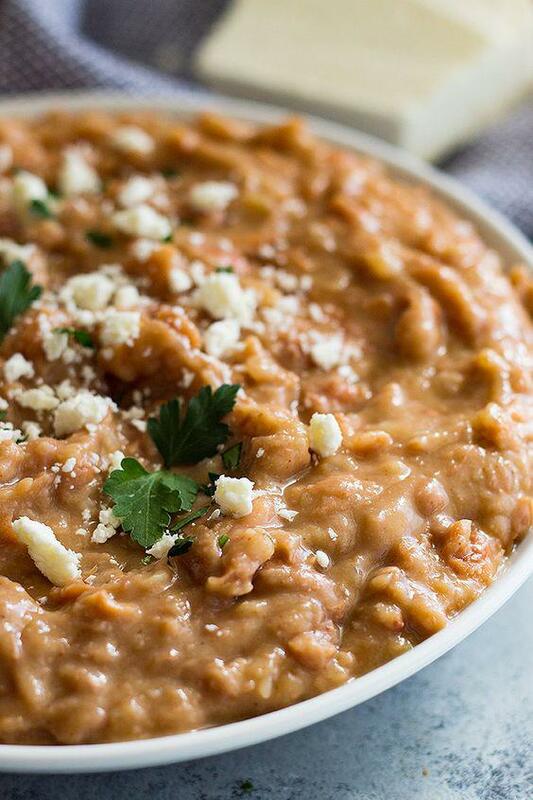 Making the canned refried beans is the shortcut to a delicious meal. They take a short time to prepare. It should take you at most 10 minutes to prepare your favorite canned beans. Moreover, there are various recipes that will make your ideal beans tasty and spicy or full of flavor if you want. But, for an authentic flavor, the recipe in the link below will guide you. 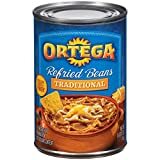 The best authentic canned refried beans. When you want to reduce the cholesterol and saturated fat in your diet consider replacing your meats with refried canned beans at least twice or thrice a week. What’s more, you will be enjoying your beans the Mexican style if you are keen to prepare it the same way Mexicans do.